*How many tiers do you require? 3, 4, 5 or 6 Tier Classic Wedding Cake from a choice of six designs. 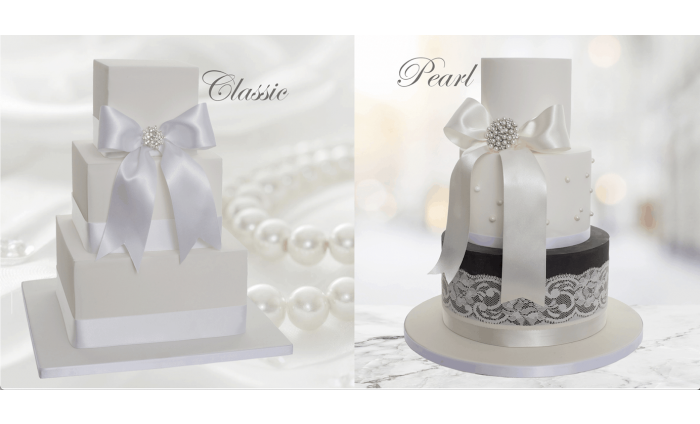 Voucher for a 3, 4, 5 or 6 Tier Classic Wedding Cake with six designs to choose from! All designs include on trend sharp edge icing finish. Any of the six designs can be made in a 3, 4, 5, or 6 tier version. Any design can be personalised. Rose: a stunning style with a delicate cascade of our hand crafted sugarcraft roses and a sparkling diamante trim feature tier. 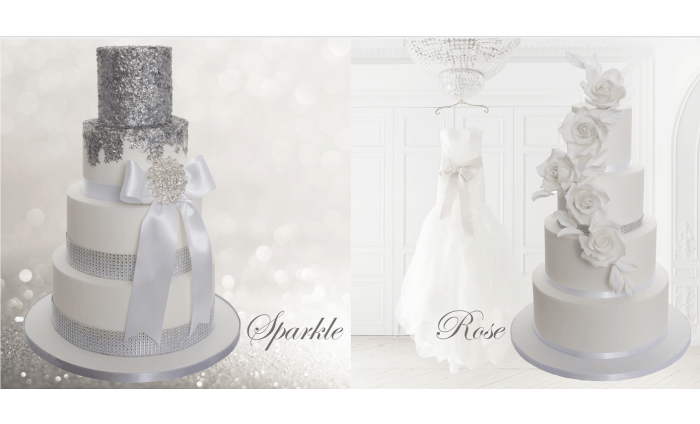 Sparkle: a beautiful, contemporary cake with an edible sequin covered top tier, fading into a crisp, white design with diamante ribbon detail and a feature bow, with a sparkling brooch centre. 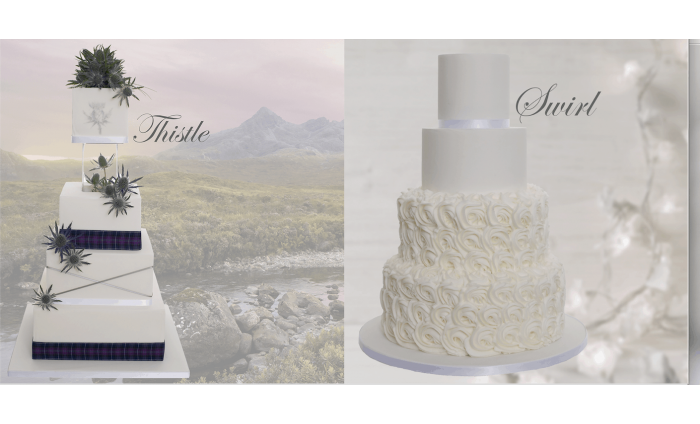 Thistle: a modern Scottish-themed design dressed with fresh thistles, tartan ribbon and a hand-painted silver thistle on the top tier. Classic: a simplistic, delightful style with white ribbon and a prominent bow with diamonte brooch centre. Swirl: a perfectly pretty design featuring rose-piped base tiers and contrasting fondant upper tiers. Pearl: an elegant style complete with diamonte feature bow, scattered pearl detail and cream lace on a charcoal iced backdrop. You can choose from 27 delicious flavours including Sponge, Toffee, Pink Vanilla, Chocolate Malteser, Chocolate Mint, Chocolate Orange, Baileys, Malibu Coconut, Raspberry and Irn Bru. A surcharge of £25 per tier will apply for fruit cake or allergen-free (Dairy Free or Gluten Free options). Intricate decorations or additional tiers can be added for a surcharge. Ribbon colour can be changed at no additonal cost. Designs with Fresh flowers shown are included in the deal price. Adding alternative fresh flowers: Price based on the type and number of fresh flowers required. 3D Cakes, Scotland's most awarded Cake boutique. The Scottish Wedding Awards - Cake Designer Of The Year 2019 - Overall Scotland Winner & Regional Winner. 27 flavours to choose from for each tier. Voucher valid for 6 designs as pictured only. Intricate decorations can be added for a surcharge. Voucher can be redeeemed online only. To redeem please see details at the bottom of your purchased voucher. 3D Cakes Date Guarantee applies - see below for details. If you give 3D Cakes at least 4 months notice and they are fully booked for your wedding date, you'll receive a full refund. £25 per tier surcharge for fruit cake, gluten free or dairy free. Please note 3D Cakes recommend delivery on all Wedding cakes - collection is at your own risk. Collection times: Tuesday to Saturday from 9am to 5pm. £30 surcharge for delivery and set up to anywhere in Mainland Scotland. 3D Cakes guarantee to be able to supply your cake for your chosen date provided that you redeem your voucher and select your wedding cake with a minimum of 4 months notice. If your wedding date is less than 4 months away, they suggest contacting them to confirm availability.